There are various benefits for you picking up the best hyaluronic acid cream for your face and even neck and decollete. Hyaluronic acid is an effective anti aging ingredient used in a lot of creams and moisturizers today because of its ability to retain moisture and fill up the spaces between collagen and elastin in your skin which leads to less wrinkles and fine lines appearing. So, a good quality hyaluronic acid cream can keep your skin more plump and youthful looking with less fine lines and softened wrinkles. When you are in the process of choosing a cream like that, you can look for other effective ingredients which can boost hyaluronic acid’s function and provide you with stronger anti aging results. For example, vitamins C and E as well as Retinol are well known for their skin properties. Apart from a good hyaluronic acid cream, also keep in mind that hyaluronic acid serums which sometimes contain vitamins C and E are also very popular among users and have excellent reviews. Another plus for using a hyaluronic acid serum is that you can benefit from a more concentrated form of hyaluronic acid and know the exact percentage of it contained in the serum. Still, a cream will always be your first choice for moisturizing in your daily skin care routine, so let’s have a look at a selection of moisturizing creams with hyaluronic acid and other effective ingredients which gather positive user reviews. 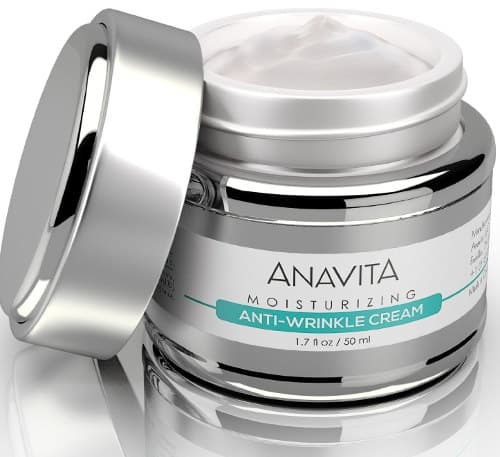 Anavita Moisturizing Anti wrinkle cream for face and neck contains powerful anti-aging ingredients that can help to diminish those fine lines and deep wrinkles, stimulate collagen’s production and moisturize skin while making it more firm, toned and youthful looking. State of Art Triple-action formula smooths fine lines and deep wrinkles, firms, tightens, tones and moisturizes skin. Powerful combination of Hyaluronic acid, argireline and Matrixyl 3000. Non-greasy rich cream which goes on easily and absorbs quickly. Paraben free and safe for all skin types. Used as an anti wrinkle day and night moisturizing cream which also works great as a makeup base. Suitable for both women’s and men’s skin. Aqua, Cetearyl Alcohol, Glyceryl Stearate (and) PEG-100 Stearate, Stearic Acid, Acetyl Hexapeptide-3, Palmitoyl Pentapeptide-4 (Matrixyl) Dimethicone, Sodium Hyaluronate, Citrus Aurantium Dulcis (Orange) Fragrance, Phenoxyethanol, Caprylyl Glycol, Potassium Sorbate. It seems strange that although hyaluronic acid is included in the title of the cream, this ingredient is not repeated in the ingredients list. Anavita cream also contains Sodium Hyaluronate which is a salt form of Hyaluronic acid that draws and retains moisture which plumps the skin and diminishes those fine lines and wrinkles. You simply dot the cream on a clean face and neck and massage gently into your skin until completely absorbed. Rich and Creamy– Users find this moisturizer to be rich, creamy and luxurious but without the greasy feeling many other moisturizers leave behind. There were even a few reviews by people with oily skin that were very glad with how the cream performed on their complexion. Excellent Base for Makeup– Not only does this moisturizer soften the skin, but it actually makes an excellent base for make-up, allowing it to go on smoothly. 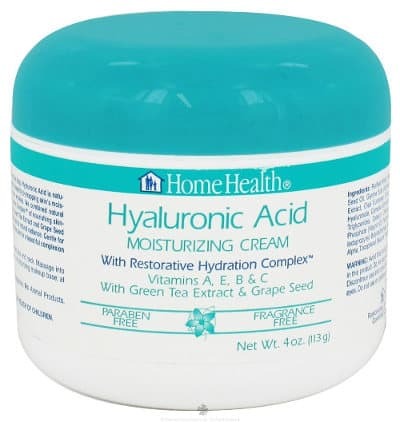 The Home Health Hyaluronic Acid Moisturizing cream is not a big brand name moisturizer that carries with it a huge price tag, but it does contain a lot of vitamins and minerals your skin needs. Contains a special blend of ingredients designed to nourish the skin. No parabens, mineral oil, petroleum, artificial colorings, fragrance and gluten included. Comes in a 4 ounce jar. Water, caprylic/capric/myristic/stearic triglycerides, cetearyl olivate and sorbitan olivate, grapeseed oil, glycerin, chamomile flower extract, sodium hyaluronate, olive oil, dehydroacetic acid/benzyl alcohol, dexpanthenol, sodium ascorbyl phosphate, caprylic/capric triglycerides (and) sodium ascorbate (and) tocopherol (and) retinol, xanthan gum, bisabolol, d-alpha tocopherol, aloe vera gel, citric acid, green tea extract. Hyaluronic Acid, retinyl palmitate (vit A) fruit oil. You simply apply the cream to a clean face and neck both morning and night using upward and outward strokes. The cream quickly absorbs into your skin where it helps to hold in moisture and the vitamins nourish your skin to make it healthier over time. User reviews for this product are good but not great. The biggest issue most users have with this product is that it is poorly packaged and some users got only partial containers of cream as some leaked out in shipping. Face Feels Firmer and Softer– This cream’s moisturizing effect helped to tighten skin and make it feel softer and less dry. Non Greasy– Users also liked the fact that this cream went on easily, absorbed quickly and didn’t leave behind any greasy residue. Soothing– It felt soothing when it was applied, simply making their skin feel better and look better. Extremely low priced hyaluronic acid cream-For some people, it is really amazing the fact that this cream works for them more effectively than other highly advertised creams that they have tried and at a much lower price. P erfect Image Hydra Repair Wrinkle cream is designed to be used after a face peel, but can be used as a regular moisturizing cream by people who have dry skin, or are simply looking for a good moisturizer to help keep their skin healthy and fight the signs of aging. Professionally formulated treatment to restore hydration. Contains Hyaluronic acid, Matrixyl 3000, Argireline and natural botamical extracts to repair and revitalize skin. Deals with wrinkles and fine lines, crow’s feet, rough, dull and dehydrated skin, as well as forehead creases. Reduces cellulite and stretch marks. Contains antibacterial and anti-fungal properties to protect your skin after a skin peel. Apply a small amount of this cream to your fingertips and gently massage into the desired areas for 15 to 20 seconds. 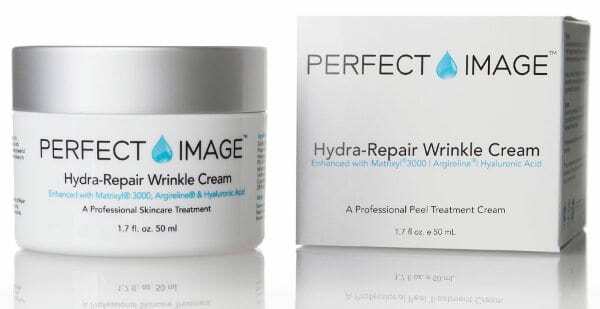 What Do the Perfect Image wrinkle cream Reviews say? While Perfect Image wrinkle cream is designed to be used after a peel, many of the user reviews are written by people who use it as a daily skin cream and moisturizer, finding that it suits their purpose well. Improves Skin Texture– Most users found that this product improved the texture of their skin, leaving it much softer and less dry. Doesn’t Irritate Sensitive Skin– People with sensitive skin also mentioned that this hyaluronic acid cream hydrated their skin without irritating it. 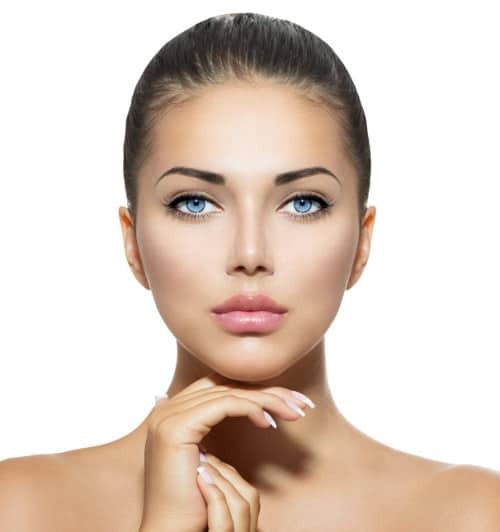 In conclusion, the best Hyaluronic acid cream is the one that can reduce signs of aging and help you get a more firm and toned looking skin which is properly moisturized and more youthful looking. It should also go on smooth, absorbing well and helping your skin retain its natural moisture. Combining a cream like that with a hyaluronic acid eye cream and a good hyaluronic acid serum can provide you with more positive anti aging results.